EDIT: The ocean is also important to food for us, hence, the change in the header. EDIT: Various threads seem to be moving onto the subject of agriculture and its connection to the future of FOOD. For humans, anyway. Let us go there. Jeff Masters recently published a new article on his blog at Wunderground detailing some extreme temperature variations in the U.S. midwest. I do not live there, so cannot comment personally, but one specific example keeps coming back to me. In Iowa, two weeks ago, there was record snowfall. This week temperatures hit up to 106F. By no stretch of my imagination can I imagine this can be good for agriculture or local ecological processes in general. While I do not have any links, I do recall reading somewhere a while ago that the timing of, for example, baby bird births and their food sources are starting to fall out of sync. i wonder if these new extreme swings in temperature might upset microbial processes in the soil? Kill new springtime plant life necessary for birds, bees, worms, or other creatures so essential to our current understanding of how the world works? The bee thing especially worries me, as colony collapse was pretty bad last year. EDIT: There has been some discussion about this topic on Fishmahboi's 'When and how bad" thread, which I find to be very helpful and engaging. I am thinking a narrower discussion about the immediate impacts on soil, etc. might be interesting, though. I'm not an expert, or anywhere near being one - but I think you'll find mismatch in the timings of insects and birds (and all sorts of other things - such as when flowers bloom and so on) has been with us for quite some time now (decades?). This in my view has been the real canary in the coal mine - the Arctic is somehow described as that, but it would seem more apt to describe it as the igniting firedamp that the canaries already died warning us about. Extreme fluctuations have plenty of scope to damage yield, note the near 100% losses in fruit in some parts of Michigan and other northern states last year - an anomalously hot and early spring gave way to a late frost that wiped out fragile buds almost totally (certainly to the point where attempting harvest was not economically viable - and in fact - almost totally). I think it would also be relevant to consider insect pests. Insect populations that usually would be kept in check by natural forces (winter) or predators can become a problem very rapidly indeed. For a slower example - I'd point at the pine beetles busy turning extensive swathes of forest into carbon dioxide again. I recall outbreaks of army worms last year in the US - but am unsure how common that is there. Locusts are another example of a hazard that could surprise us by shifting their range - and in situations of social instability (as created by the war in Libya - this disrupted locust spraying in nearby regions causing knock on consequences) the ability of societies to respond can be eroded. I can't help but feel that there are any number of unpleasant surprises waiting for us in this arena, many of which we won't even suspect until they happen (and the GM pesticide tolerant crops have locked those relying on them into an arms race as the pests are gaining resistances rapidly - as well as apparently placing a critical straw on the back of various pollinators - bees especially). I live in Minnesota, and experienced the bizarre weather of which you speak. When we get these very tall waves in the jet stream, the temperature contrast from one side of the wave to the other is stark. There was frost the one morning, and 99 degrees the next day. 36 hour temperature changes of 40-50 degrees are fairly frequent in Minnesota, but this one was something else. The soil itself has a lot of thermal mass and a relatively stable temperature. Not to say it couldn't happen, but it wouldn't be the first place I'd look for disruptions caused by this kind of weather. Depending on the jet stream's preferred configuration in any given season, there can be up to two months of leeway either way as to when the warm temperatures arrive and depart from the mid-latitudes such as Minnesota. Some things are faster to respond to the temperatures than others. Insects usually arrive with the temperatures, whether early or late, but if the Spring arrives early, the plants will wait as they know a late-season frost could come. So what I'm trying to say is, the timings of various things relative to each other fluctuates a little bit year to year anyway. I think there is some play in how things interact, as they are used to the minor variations. Certainly, as things get wilder and wilder as time goes on, we could (and probably will) see serious disruptions to these systems. But so far, I haven't see any here in Minnesota. Any year could be the year. Fingers crossed it's not this one. Drought conditions are improving across the US. I have no idea what microbial processes in soil you are concerned about. Areas have agricultural records and analysis based on the year's weather conditions. I'm not aware of an attempt to look for climate change patterns, but I know there are details covering just about anything weather related in those reports. Obviously plants need water, but many plants are sensitive to frost during germination and reproduction. The most damaging extreme that I am aware of involves warm weather encouraging growth too early in the season that can be frost damaged. On the other end, many plants will continue reproduction until frost stops it at the season's end, so an early frost can kill that production. If a farmer has nice days in February, he isn't going to rush and plant his crops, because he knows the chances are frost will kill those crops. Besides the obvious damage from droughts and floods to crops, modern agriculture using heavy equipment has always had problems with rain preventing planting and harvesting. A farmer can miss the window to plant corn because the fields are too wet to plant. Some grains other than corn only have a short period to be harvested or the grain will fall to the ground. If exceptional weather brought repeated wet weather to such an area during harvest, it would reduce crops like wheat yields and it could prevent planting in the spring of any crop requiring heavy equipment. Certain types of fungus can be encouraged by wet weather and completely destroy crops. I don't see short term temperature extremes affecting the soil, because the soil doesn't change temperature according to surface temperature, therefore it's temperature is buffered against short term extremes. Soil temperature is monitored for a variety of reasons, such as when insects will emerge. In the battles of insects verses plants and insects verses insect, longer term temperature variations, like warm and cold winters have an agricultural and environmental impact. The trend I've seen lately is mild winters not reducing pests enough to keep summer damage to good levels. These types of connections are well established and they predict which pests will become a problem, based on how the past weather played out and what the present weather will encourage. The soil itself is a potential major source of additional carbon dioxide into the system, depending on how it is affected by climate change. I really don't know much about it though, beyond vaguely being aware of the possibility. Increased warming will definitely increase microbial activity in permafrost or where cold limits it, but the thread is about agriculture. It doesn't just apply to soil carbon in permafrost or cold limited regions that climate change may have an impact on the soil microbes and related ecology. Everywhere that conditions change there is a possibility that changes will occur in the soil. Why would you suppose that the soil would be exempted from changes in temperature or moisture or any number of other things that affect the behaviour of that portion of the ecosystem? By implication I find it a rather strange idea that soil changes don't relate to agriculture. It's hardly reassuring that we don't really know much about the impact climate change will have on the soil carbon budget. During drought, soil dries up and is hard as a rock. You can't plant it, nor will anything grow in it anyway. During floods, it gets goopy and you can't plant or harvest, and it can destroy crops if it happens at the wrong time. If the soil temperature is too cool, you can't plant yet, you have to wait for it to warm up. Within rational limits of what the climate is capable of, nothing bad can happen to plants from having a soil that's really warm, as long as it's adequately moist. Anything that can be grown in the north can be grown at the equator in much warmer soil, unless it needs a long day or a winter dormancy as part of its life cycle. As mentioned by ggelsrinc, soil temperatures staying warm over the winter can encourage development of insect pests. That's the extent of soil temperature's effects on agriculture. Microbial activity doesn't have much to do with it. Modern chemical farming has greatly altered the soil ecosystem and the plants don't care because they're getting the nutrients they need added. Plants can grow in rocks with no organic matter whatsoever, if the rocks have enough of everything they need. You see this a lot in deserts and mountains, and around the Canadian Shield. The irrigated farmland around the Phoenix metro area and the rest of southern Arizona is incredibly fertile and productive. The microbes in that soil are vastly different than the soil here in Minnesota, but they grow some of the same crops. Tomatoes and strawberries are two that come to mind right away, and they grow just as well in either location, at least as far as the soil is concerned. As average soil temperature increases, it may indeed contribute more carbon to the atmosphere. I'm sure the soil microbe balance will shift. But that has little or nothing to do with agriculture. This thread is entitled "Weather "whiplash" and agriculture", so microbial activity where there is no agriculture is off topic, unless it's done to compare. When Neven asked what he should do in his "How to resuscitate a dead field" thread, I suggested planting annual ryegrass instead of clover or clover/alfalfa mix. The logic is why worry about adding nitrogen to soil that lacks the humus to retain the nitrogen? Agricultural land doesn't have the humus for microbes to consume, like a forest does. If you have ever seen a soil profile of ryegrass, you would understand why smart farmers use it for a winter cover crop and ryegrass is a normal lawn grass in many areas. I've seen soil profiles showing thick roots two feet deep. Farmers cut and bale the ryegrass for hay, but when they plow it, it cuts the plant in half and adds volumes of humus to the soil. It aerates the soil and that humus keeps the nutrients, like nitrogen, from being washed away. Grasses are analogous to trees in many ways being masters of their domain (regardless of size), but the analogy here is to how they store organics in the soil that microbes can use. If you examine the areas of the world where agriculture has been applied, the amount of carbon in the soil has been reduced. Microbes can't make CO2 from carbon that isn't there. In the old days, agriculture cut and slashed and moved on when carbon was depleted. It isn't easy to replace carbon in the soil over large areas or a farmer would do so. Let's expand the concept of agriculture to include forestry! If I wanted to rapidly grow trees in areas once covered by glaciers or experienced periods of permafrost, I'd know that such conditions rob the soil of calcium and potassium and the same logic is applied to forestry. The northern areas that impress me as having much carbon to release back into the atmosphere are areas that grew peat and have slowed decomposition before equilibrium. Those areas could release a lot of carbon before conditions exist to become a carbon sink. Growing evergreens just doesn't sink much carbon, so an area that was once taiga and became tundra can't have much carbon due to recent geological time cooling. The Eeemian would have flushed carbon away much faster than it can the HTM. Since we are near the HTM and Eemian, I don't expect much terrestrial carbon to exist, but any carbon to the atmosphere is more. That doesn't mean warming northern areas will be releasing much more carbon than it can sequester by encouraged growth. The carbon will come from mankind and we can't blame the Earth for it. The bacteria help the plant get the nutrients it needs faster when they're locked up in more complex molecules, or in the case of rhizobacteria, in the atmosphere, but if those nutrients are already being supplied by an outside source, the bacteria aren't necessary. We dump nitrogen on corn fields because nitrogen-fixing bacteria don't fix it fast enough. In hydroponics, a sterile nutrient solution is often used. At this point, the soil is just a medium to hold the roots in place so the plants don't blow away. Most if not all of the nutrients are supplied as fertilizer. The symbiotic relationship with bacteria has been replaced by a symbiotic relationship with humans. plant growth and enhance resistance to disease and abiotic stresses. I like that, remainds me on (more in Café) and fits well with my view of Nature (everything is connected). Perhaps AG practice will be changed in future. Austin area peach crop ruined by weird weather. Farmers fail to feed UK after extreme weather hits wheat crop. Long cold winter in UK following a cold summer has badly affected bee colonies too. Overall losses estimated at 33.8%, the worst yet recorded (although it should be stressed that figures have been kept only for the last six years). Losses in Devon estimated at 50%. This has implications not only for honey (which we could manage without) but for insect-pollinated plants. I confess I don't know enough about bees to know what would be a "normal" loss from a hive over winter, but over a recent mild winter (2010/2011) it was only 13.6%. That's quite grave, but at least with the improved summer outlook for Ireland and Britain, perhaps crop yields in these two areas might improve. I'll add this little bomb. A new report says that the world will need to more than double food production over the next 40 years to feed an expanding global population. But as the world's food needs are rapidly increasing, the planet's capacity to produce food confronts increasing constraints from overlapping crises that, if left unchecked, could lead to billions facing hunger. Too bad we are going in the wrong direction with ag production the last few years. Re the Guardian piece above implying that British farmers are not going to feed their population this year. If I am not mistaken the UK imports about 50% of the food they consume (just from memory..I did not look it up). So the real story is the wheat harvest is going to be down. your statement implies that global harvest have been going down the last few years. Global production has been going up not down. I checked the report referred to in your link and the guardian article is not doing a good job of reporting what it said. It is much more nuanced. If population goes to 9.3 billion from our current 7.1 then population increases 31%. So all things being equal (which they are not of course) it takes 31% more food production to keep up with population. The report comes up with higher numbers required because it assumes that we are going to eliminate malnutrition (fat chance) and that a very large number of consumers are going to move up to the middle class and their dietary requirements are going to change. Thus they come up with the requirement to double food production. I am skeptical that their assumption will come about. Considering all the factors impacting civilization over the next 40 years I have many doubts about this vast rising middle class existing then, malnutrition and starvation are likely to be much more prevalent rather than less. IMHO just increasing global food production by the 31 to say 40% needed for the added population will be a real challenge. As I have stated earlier I think that the industrial food system will be at the breaking point in about 40 years so I don't see how they get there from here. I'm inclined to agree, Jim. It's not simply a question of increased food production (as if it were simple) but the whole business of distribution and social and political inequality. Even now we have farmers exporting to Europe from countries where people struggle to feed themselves. Sorry, I did not mean to be misleading and am no expert in agriculture. There have been reports of major producers experiencing crop reductions based on drought/flood conditions the past few years. Worldwide, what are we, a 1% increase or so? Slight increases in total food production only give you a small bit of the picture. How sustainable are those gains? What are they based on? How much more do they cost those who have little to spend? 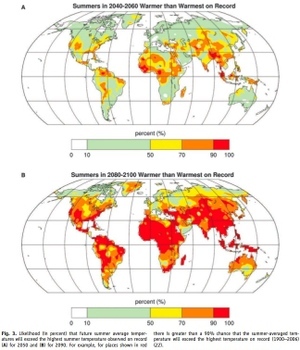 Aquifers around the world are being drawn down, some at rather fantastic rates, mostly for agriculture. Once those are gone, they're gone for good (at least on human time scales). Overuse of marginal lands is also a short-term, ill-conceived strategy. And of course increased meat eating among the global elite means that there is less food of the total left for the poor and it is more expensive. ritter, no worries. Most people get the impression from the daily news that overall food production is decreasing. But the news focuses on the ag 'weather' so to speak. A crop shortfall gets a lot of attention but the overall trend in production does not. It is sort of like looking at weather and climate. I ran a couple of number for you. The usual metric for measuring global food production is to look at global grain production (not many people actually try and measure the production of vegetables). I took the last 10 years of global grain production and averaged the first five and then the next five to show the trend. 2008-2012 averaged 2.4% higher than 03-07. So your estimate of 1% was not bad. Maintaining this increase is going to be very hard in light of our problems. We should be able to keep pace with population growth for some time, but eventually we will fall short. And Willi is dead right. We are burning the candle from both ends so to speak. There is nothing sustainable about the industrial food system and what we are doing now is going to bite our descendants in the rear big time. But the industrial method is all we have as sustainable practices cannot feed 7.1 billion. Carrying capacity numbers usually top out at under 2 billion and go as low as 500 million. 2008-2012 averaged 2.4% higher than 03-07. Thanks for the number crunching. Yes, farming GMOs with fossil water and totally reliant on chemical inputs and fossil fuels is, well... What could possibly go wrong?! When you combine new crazy weather patterns and peak oil, I think you will see the wheels fall off of industrial ag sooner than your 2040-50 prediction. But then again, I'm a bit of a pessimist! Didn't the article you posted by the intelligence service state that in 7 out of the last 8 years we produced less food than we used? It sounded as though we're already digging into food stores on a regular basis. As usual there is more to the story. I don't have time to actually rerun the numbers right now so I will shoot from memory. The big wrench in the gears of agriculture production is bio-fuels. If we just look at what the US mandated ethanol in fuel program has done to global grain supplies it will demonstrate the point. If my memory is correct the amount of corn used in the US each year to make ethanol fuel is the equivalent of 20 days of global grain supply. As we have all been seeing in the news the last few years the subject of the global grain reserve comes up every time there is a harvest shortfall (whether wheat, corn, rice, etc). Recent global grain reserve numbers are somewhere around 60 days. Which is very low by historical norms and puts supplies in danger of being insufficient if there is a total harvest failure in a major region (very rare). But where would we be with global supplies if the US ethanol program did not exist? Probably near 120 days reserve and no one would even be talking about it. What they would be talking about would be the financial crises in the agriculture industry due to low commodity prices. The primary purpose of the US ethanol program was to create artificial demand for corn and cause the price to rise. This dramatically improved the financials of industrial farmers, Monsanto, ADM and a host of other agriculture related businesses. It was in essence a government welfare program for the agriculture industry dreamed up and promoted by the lobbyists paid for by the taxpayers via subsidies and lower mpg fuel. It was a great sell politically and it will be fiendishly hard to ever kill. I have no idea of the scale of using food crops for bio-fuel production on a global scale, but I can imagine that it is substantial and would add another significant margin to global supplies if eliminated. Or it would reduce environmental destruction (palm plantations for instance). So what I am saying is that, yes we have been eating into our global reserves, but it's not because we are eating more than we are producing rather that we are burning it for fuel. It's a choice I guess (sarc). I think bio-fuel is a major part of the current pressure on food production, but I wonder if there isn't some reason why it is continuing despite the obvious stupidity. Is it possible that it is helping offset peak oil slightly? If oil supply was insufficient prices will soar there - which still makes food (and a lot of other things) cost more. With respect to food I think people fail to realise that just because food production is still tending to increase doesn't mean we don't have a problem. The bottom line is that demand for food is rising every year. If the growth of production is less than the demand growth, a problem is accumulating and therefore one can grow production and yet still fall backwards in food security. In any case I don't see how the changes in the weather due to the ongoing loss of the Arctic are not going to harm global food production. We are nowhere near the end of this process yet! Given the conversation on weather and climate impacts on agriculture and food production, the following conference provides a number of excellent papers on food production, food security, agro-economic impacts, modeling, etc. On May 27-30, 2013, the International Conference on Climate Change Effects occurred in Potsdam. There are approximately 100 science based papers that are linked on the website that cover everything from agriculture to hydrology - globally and regionally. There are alot of papers on climate impacts on Europe, Africa and Asia. There are more on modeling and use of modeling to predict future impacts, policy issues, climate change action - to prepare for impacts. It is a treasure trove! Very interesting article about recent research on crop yields that compares non-GM and GM crops in Europe and North America. The evidence indicates that GM crops do not result in higher yields as many think.
. In addition to increasing crop yields faster, European nations have also reduced pesticides more than we have. “The US and US industry have been crowing about the reduction in chemical insecticide use with the introduction of Bt crops [GE crops that produce their own pesticide],” says Heinemann. “And at face value, that's true. They've gone to about 85 percent of the levels that they used in the pre-GE era. But what they don't tell you is that France went down to 12 percent of its previous levels. France is the fourth biggest exporter of corn in the world, one of the biggest exporters of wheat, and it's only 11 percent of the size of the U.S.
Of course Monsanto is aware of all this. The word evil comes to mind. I was being just a little sarcastic with the above statement, rather than agreeing that bacterial activity isn't important to agriculture (particularly when you consider not all agriculture is western style agribusiness). As the article says, we really don't know enough about the bacterial role within the soil to say anything for sure. The link is to published research on the trend in major crop yields and the impact on future food production. It indicates that around 2050, if we cannot change the current trends, the agriculture system will no longer be producing sufficient food to feed everyone. But it is good detailed reading on what is going on in agriculture. It is pretty long. EDIT: I forgot to mention that the authors did NOT take AGW into account. So they are probably being conservative (or optimistic might be a better word). This link is article about the above research paper so it is redundant in most respects but it does have a slide show on about 19 crops which will largely disappear if we lose the honey bees. Most of the major fruits in your nearby store. I think the primary reason that AGW effects are not included in peer reviewed research like the above paper, and similar works like the Limits to Growth books, is that there is no rigorous way to quantify AGW. The above paper does a really competent job with hard data and comes up with some pretty stark conclusions. Unfortunately there is not equivalent data on AGW to use nor for agriculture specialists do they really have the expertise to include the physics of climate science in their work. What I would really like to see is an interdisciplinary set of research reports that included authors who were top level climate scientists, agricultural experts, energy experts and maybe (choke!!) an economist. But these types of efforts just never seem to happen. It is left to amateurs like our selves to try and integrate all the parts and come to conclusions that encompass all factors. It takes the experts out of their comfort zones and they also do not get professional recognition for working with experts in other fields. And us amateurs make lots of mistakes and poor assumptions (but then again so do experts). For instance when I opine that agriculture will collapse circa 2050 I think I am taking AGW into account. My opinion on how bad AGW effects are going to be over the next 35 years lead me to the conclusion that the agriculture industry will be able to mitigate and compensate for the changes which AGW will cause for quite some time. I do not believe that the system is as fragile (in the short-term) as many others think it is. So I end up at 2050. But I am not a multi-disciplinary expert and my opinion may just be junk. But the same applies to everyone else that I have seen write on the subject. You can be a PhD in physics and be at a complete loss on other important subjects as we see all the time. For example I read Joe Romm's Climate Progress all the time. Lots of good stuff there, but it would be hard to find a man who thinks he knows more about everything than he does, yet he is completely clueless about all kinds things and worse than that he has no idea he does not know. Excellent lecture. If the science is sound and it certainly seems to be, we should expect serious problems in 2050 and the primary reason is AGW. It is likely that I will see most, if not all of this. I am 57. And of course, there are other pressures on agriculture, such as increasing water shortage. Plenty will fall from the sky, but not in the right places. I actually still think 2050 is pretty optimistic. We are already seeing stalled highs that cause catastrophic drought and heatwaves (some of the most dramatic being Western Europe '03 ~35,000 dead & Eastern Europe/Russia '10 ~50,000 dead...), and stuck lows bringing endless rains, as in Britain the last few years, and of course Pakistan in '10, but also many others. Both droughts and flooding are devastating to crops. There is no longer much of a grain reserve. As these extremes accelerate--becoming both more frequent and much more severe--in the coming years and decades in major crop-producing areas, the price of food is likely to rise far beyond what the poorest can pay for. and, well, there you have a nice little recipe for greater and greater global food shortages happening in more and more years in the coming decades. I also think 2050 is exceedingly optimistic - but either way - I get stuck with the consequences (if it's inevitable, I'd rather it was sooner than later). I think conflict and mass migration (internal and external) could play a far bigger role than most people think - for some reason a lot of people seem to ignore the human factor in collapse, concentrating instead of everything else. As population climbs and resource availability diminishes (and this includes geopolitical access to the resources, not just the physical presence on the planet) the stage is set for an almighty crunch. Thanks for that important added ingredient. I certainly didn't mean to imply that my list was exhaustive! This massive influx of immigrants/raiders is generally credited (along with some other factors) with bringing down the great empires (or at least their current dynasties) of that part of the world at about that time: The Egyptians (19th dynasty), the Hittites, Mycenaeans and Mitanni. This time it may be the Egyptians themselves, along with many of their MENA neighbors (Yemen anyone? ), will be the ones moving over land and sea to find places with enough arable land and water to support them. Drought and Flood are two key causes of social instability, and one primary impact of both is on agricultural production. In reality we are already experiencing these impacts, drought caused agricultural production shortfalls, and the resulting food inflation has been a major stressor in countries experiencing conflict. While agriculture seems to be on the mend compared to last year, that does not seem the case in any countries where the final crop production numbers are not meeting expectation for key crops. - Agriculture depends totally on oil concumption, if by any chance, there is AGW then this farmer would have to reduce dramatically CO2 emissions (I am thinking stopping and even more start to store CO2) ! - The increase pressure of copyrights on seeds, disallow many people to grow there own seeds, thus they depend increasingly on the market. Secondly the seeds do not anymore adapt themself to the land bringing for sure some bad omen for the futur (at a moment when they need to adapt most)! - The governements by law tend to forbid the little agriculture in order to ease their industrial friends wich is not good for self resilience. - The subsidies of agriculture will stop abruptly when the real financial crisis will be there and so the capacity of the farmers to cope with weird natural events. Me also I do think this will happen earlier than 2015 ! This recent article in the Graun touches on these issues and may have been cited before on one of these threads. At this point I think again about the formation of NorthCom and want to reach for my tinfoil hat. Not so sure you need a tinfoil hat, Anne. This is the reality we now live in. Best to recognize it as openly as possible. 1. "That's completely insane. Ridiculous. Wacky." 2. "No, wait... isn't that what people said about the idea the government was spying on everything?" 3. S**t, what's the truth? It's theoretically possible, isn't it? I mean, damn it, where do you draw the line now in identifying things you write off as half baked conspiracy theory - and things that have enough truth to them to take seriously? Hey, just 'cause you're paranoid, it doesn't mean that they aren't really out to get you! Does Sea Ice loss create the condition for an emerging permanent El Nino state? the main northern hemispheric pressure gradient (Ref 1) – the polar vortex collapses (Ref 2), maybe even persistent, in regards to the sea ice state. This in turn changes the major air oscillation, the jet stream(Ref 2). Which basically means less air flow and/or different air flow – hence profound changes with ripple effects(due to extreme weather events) through out the affected earth systems. A new “mode” based on a different atmospheric regime is established, which primary characteristic seems to be persistence of conditions(Ref 3). This new mode hints especially to a interconnection with the IPO index(Ref 4), which suggests that ocean circulation will be affected. The loss of sea ice and following rapid changes in atmospheric regime could change ocean wave generation which promotes a permanent El Nino configuration. When heat is just hanging in the upper surface of ocean waters(Ref 4), hence ocean dead zones will spread(Ref 5). Though, for the time wave generation seems to promote deep sea warmth(Ref 6). Further implications arise with problems associated with grain production. note that the US Midwest and all other main grain growing regions of the globe will likely be not have drifted into critical territory by 2050 even though many other parts of the world will be getting there. Then note the chart for 2090. Catastrophe on a global scale. Full article is here and is free with registration. This long presentation is well worth watching as well. What is your definition of critical territory? To me it seems pretty damning that by 2050 large areas of the planet will on average exceed the highest temperatures recorded to date with at least a probability of 50%. That suggests to me that by 2050 there will already be very serious agricultural impacts in a system very poorly placed to weather them even today. It would've been nice to have seen more nuance to the charts - for example to see how the situation progresses decade by decade (eg what about 2020, 2030, 2040? ), and also to see how the distribution of extremes changes (Hansen has shown this is already happening with extreme heat events). The reason I emphasise the latter is that you can get stonking great heat waves from blocking jet streams patterns one year - fairly cool (or even exceptionally wet) conditions the next year - and how does that look as a long term average? It suggests nothing changed when in fact lots has changed - and yield could be seriously impacted (averaged out over the planet). I defined critical territory at the point when there charts hit 50%. From the chart for 2050 ALL of the major grain growing regions are still below 50%. Even taking into account that there are going to be increasingly bad years popping up in the different growing regions, on average, we will be able to maintain a very large agricultural production for a long time. Of course, as we approach the 2050 date it gets harder and harder. But that is to be expected. We are not going to go from great surpluses to great shortages in one season. It will be gradual and we will see it coming from a long way off. The US corn to ethanol program consumes about 20 days global grain supplies per year. For no energy benefit what-so-ever. That is a very big number. And it is not just the US that has food to fuel programs. Eliminate all of those programs and global grain supplies will skyrocket and farmers will end up cutting back on production because commodity prices will plummet and many of them will be in financial trouble due to an over supply of grains. It has happened before. There is a lot of slack in the industrial ag system still and that is the kind of thing I try and point out. There are certainly a lot of things to dislike about that system but one does have to concede that it is very robust (as long as we are not talking about it in a long-term sustainable sense). It will break eventually, but it will take some time for that to happen.